At Knuckleheads Trampoline Park ★ Rides ★ Bowling in Wisconsin Dells we specialize in making your group event entertaining and memorable! Knuckleheads features 4 private party rooms to hold birthday parties for any age. The fun doesn’t end with birthdays. With activities for all ages and interests Knuckleheads is the perfect place to hold your family reunion, bachelor/bachelorette party, post prom, team/club outing, or school event. 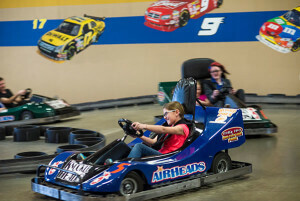 Knuckleheads Trampoline Park ★ Rides ★ Bowling features a full bar and menu. The menu offers a wide range of appetizers, sandwiches, wraps, burgers and specialty pizzas. Knuckleheads also offers an extensive banquet menu for large groups including many buffet options and hot and cold appetizer selections. The laid-back bar atmosphere is perfect for company events! Our gorgeous bar and high-top tables offer the ideal space for an adult get together. 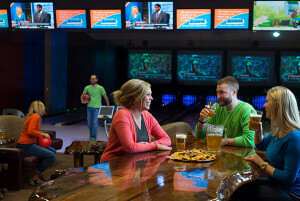 Coworkers can enjoy a cold beverage while they bowl a game on our cosmic lanes. 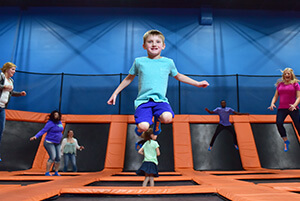 The more adventurous participants can jump around in our Trampoline Park, or enjoy a quick race on our indoor Go-Kart track. Knuckleheads also offers great company rates to invite the whole family. Adults can enjoy bowling while the kids experience the amusement park. 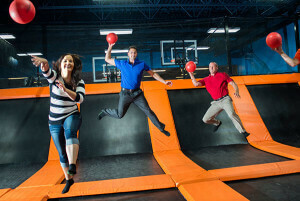 Knuckleheads Trampoline Park ★ Rides ★ Bowling would love to customize a group event just for you! Knuckleheads Trampoline Park ★ Rides ★ Bowling is great for employee outings, whether the whole family is invited, or it’s adult’s night out! Our delicious pizza buffet is the number one choice for food, but we also offer a banquet menu with a wide range of options. Don’t forget, Knuckleheads also offers a full bar. We have our trampoline park and ropes course for the more energetic adults, or bowling and go-karts for those who prefer to relax. Invite the family and the kids can enjoy our entire amusement park! 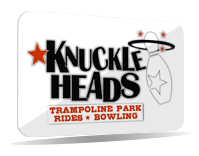 Knuckleheads Trampoline Park ★ Rides ★ Bowling offers great package deals for all teams and clubs. Bring the whole team, plus siblings and parents! Packages include options for adults to eat and socialize, while the kids eat and play! Knuckleheads Trampoline Park ★ Rides ★ Bowling is a proud supporter of schools and education! We believe all kids should have equal opportunity to a great education, as well as be able to socialize and enjoy themselves with their classmates. Therefore we accommodate all ages of school groups, even those with a limited budget. Also ask us about our Family Fun Nights! This is a great event that offers discounted wristbands for students and families, and we even donate back to the school! Knuckleheads can make any special occasion fun! Customized packages are available for any type of event! CONTACT US TO SET UP YOUR EVENT TODAY!